The TSI Mass Flowmeter 4040 can be used for a multitude of gas flow measurement applications. Whether measuring gas flows in a laboratory or manufacturing setting, TSI general purpose mass flowmeters provide accurate results with multiple data output options. The display versions come complete with accessories making setup and operation fast and convenient. The TSI mass flowmeters are specified as two percent of flow rate reading. One TSI mass flow meter covers the same range as three percent (or more) of full scale devices, with better accuracy at most points. Fast four millisecond response ensures accuracy in fluctuating flows. This fast response time of the TSI mass flowmeter is ideal for closed-loop control systems and integrated volume measurements. Low pressure drop of the TSI mass flowmeter minimizes flow circuit back pressure and its impact on the system. The flowmeters cannot detect the direction of the flow only the magnitude of the flow. Also the meters are calibrated in the direction indicated by the arrow on the bottom of the flowmeter. See the application note Reverse Flow Effects on TSI General Purpose Flowmeters for the correction for reverse flows. ARE THERE ANY SPECIAL CONNECTION REQUIREMENTS FOR THE ANALOG OUTPUT? Yes. The analog signal ground return is connected to the power ground inside the flowmeter. For this reason your equipment must use a voltmeter or analog input circuit with a differential input or floating ground. Failure to use this type of ground will result in measurement errors. ARE THERE CORRECTION FACTORS FOR THESE DIFFERENT GASSES? No. These flowmeters are separately calibrated for air and 100% O2. Calibrations for the other gasses involves an internal algorithm in the meter. The desired gas is selected by an RS232 command. Once set, the LCD display indicates the gas calibration. The flow rate displayed on the LCD and the flowmeter’s outputs is then automatically corrected for the selected gas. ARE THESE FLOWMETERS PRESSURE COMPENSATED? Yes. The output readings are compensated for pressure changes as long as those pressures changes are within 0.5 to 2.0 atmospheres absolute pressure. ARE THESE FLOWMETERS TEMPERATURE COMPENSATED? Yes. The output readings are compensated for temperatures changes as long as those temperature changes are within the temperature-compensated range. CAN I CHANGE THE SCALING OF THE ANALOG OUTPUT SIGNAL? Yes. By using the "TSISetup.exe" utility program you can set 10 Volts to represent a flow 1 L/min to the full scale of the meter (interger values of L/min only). In addition, you can adjust the zero intercept of the analog output. Note that this is not a true zero adjust because the flowmeter’s analog output cannot go below zero Volts. These parameters can be changed by using the TSI Setup program that is supplied with the instrument. CAN I CLEAN THE SENSOR IN MY FLOWMETER? No. The sensor element is not accessible without special factory tools. It is also fragile and would be damaged by attempts to clean it from the outside. NEVER attempt to clean the sensor by running liquids through it. CAN I MEASURE FLOW IN BOTH DIRECTIONS THROUGH MY FLOWMETER? The flowmeter is designed and calibrated for flows in the direction of the arrow embossed on the flowmeter body. No damage will occur if the flow is reversed provided that the gas is clean. For higher flowrate the meter can be used in reverse flow with a correciton. See application "FLOW-Reverse Flow 4000 and 4100 Series Flowmeters" for a discussion on this correction. These flowmeters cannot determine the direction of the flow. If your setup presents the flowmeter with momentary flow reversals, such as during pump or valve operation, you may see significant measurement errors. Vane type pumps are especially prone to this problem. If you suspect flow reversals, look at the analog output on an oscilloscope to see if the instantaneous flow is going near zero. This type of momentary flow reversal will cause the flowmeter to read high. Contact the factory for more information. CAN I OPERATE MY FLOWMETER IN ANY ORIENTATION? CAN I SLOW DOWN THE RESPONSE OF THE ANALOG OUTPUT SIGNAL? Yes. By using the "TSISetup.exe" utility program, the sample rate of the analog output can be set from 1 msec to 1 second. DO I NEED TO FILTER THE GAS GOING INTO MY FLOWMETER? Yes. These flowmeters use a tiny sensor element exposed to the gas stream. If this sensor becomes contaminated, the accuracy can be permanently changed and the sensor may be damaged. A HEPA grade filter is recommended and should ALWAYS be used upstream of the flowmeter. IMPORTANT: Your flowmeter will remain stable and accurate if it is always presented with clean gas. DOES HUMIDITY AFFECT MY READINGS? Yes. The flowmeters are calibrated with dry gas. Water vapor changes the gas properties. See the application note on humidity effects Correcting for Humidity Effects on TSI General Purpose Flow Meters. HOW CAN I CONFIGURE THE FLOWMETER’S OPTIONS? By using the RS-232 interface, you can control a number of options on the flowmeter. These include: 1) Set the sample rate at which data is returned. 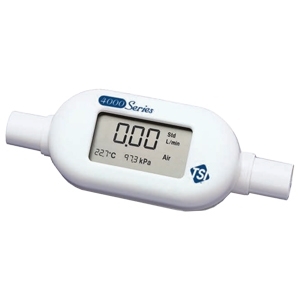 2) Select the gas calibration to be used. 3) Select either standard or volumetric units of flow. 4) Set the beginning and end trigger levels for volume measurements. 5) Set the analog output zero and span. 6) Set the analog output sampling rate. 7) Set the update rate for the LCD display. 8) Set special display scroll options for the Model 4140. HOW DO I CONNECT MY FLOWMETER USING THE TWO CABLES SUPPLIED? (See the operator’s manual for pin-out and connection details). Computer Cable, PN 1303583, 8 pin mini-DIN to 9 pin D-SUB. --Used to connect the flowmeter to the RS232 connection on a computer. --DC power must be supplied to the flowmeter’s DC power input jack. Analog Cable, PN 1303584, 8 pin mini-DIN to tinned leads --Used to connect the flowmeter to external devices or systems. --Analog output signal available --RS232 signal available --DC power can be supplied through this cable or to the DC power input jack. HOW DO I RECALIBRATE MY FLOWMETER? TSI flowmeters must be returned to the factory for calibration. They are linearized and calibrated using very specialized, automated flow calibration systems. The calibration system then stores the calibration data in an EPROM in the flowmeter. It is not possible to calibrate these flowmeters without such systems. Users that have accurate flow standards can, of course, verify the calibration. HOW DO THESE FLOWMETERS MEASURE VOLUME? They integrate flow rate over time to produce a volume measurement. The volume measurement is only available via the RS232 output.The START and STOP trigger criteria are controlled by RS232 settings. The start and stop triggers can be controlled by a flow or pressure. Also, the volume measurement can be set for a fixed amount of time. See the RS232 Command Set Manual for more information on volume measurements. HOW OFTEN SHOULD I RECALIBRATE MY FLOWMETER? To maintain a high degree of accuracy in your measurements, TSI recommends that you return your instrument to the factory for an annual NIST traceable recalibration. I NEED TO DEVELOP CUSTOM SOFTWARE USING LABVIEW® TO INTERFACE WITH THE TSI FLOWMETER. WHAT HELP IS AVAILABLE? You can download a demonstration program called ”Real Time Demo Program” from our web site. This incorporates many common elements of control, data collection and display. The LabView® source code for this demo program can be downloaded from the web site as ”Source Code for Real Time Demo Program”. IS THE READOUT STANDARD LITERS PER MINUTE OR ACTUAL LITERS PER MINUTE? The default output is standard liters per minute. By using the TSI flowmeter setup program supplied with the instrument, users can switch the output to actual liters per minute. IS THERE AN RS-232 INTERFACE AVAILABLE ON THE FLOWMETER? Yes. The RS232 interface can be used to (1) select user options and settings, (2) obtain outputs of flow, volume, temperature, and pressure. NIST is the National Institute of Standards and Technology. All test and calibration data supplied by TSI has been obtained using standards whose accuracies are traceable to NIST or has been verified with respect to instrumentation whose accuracy is traceable to NIST. WHAT ABOUT OTHER GASSES AND MIXTURES? Corrections for gasses not listed above are not available at this time. Correction algorithms for other gasses need to be developed and programmed into the flowmeter’s microcomputer by TSI. Additional gasses will be added in the future. WHAT ARE SOME APPLICATIONS FOR WHICH THESE FLOWMETERS ARE NOT DESIGNED? Dirty or unfiltered gas; Liquids or condensing vapor; Pressure greater than 15 psig; Combustible mixtures; Gasses/mixtures that are not supported (see specs); Hydrogen; Gasses outside the temperature range of 0-50°C. WHAT ARE SOME TYPICAL APPLICATIONS FOR THESE FLOWMETERS? Production Testing; Quality Assurance; Product Development; Research; Field Service; Process Monitoring. WHAT ARE SOME TYPICAL INDUSTRIES THAT USE THESE FLOWMETERS? Medical –Ventilators, –Anesthesia; Pharmaceutical; Industrial Hygiene; Metrology; Aerosol Science; Fuel Cell. WHAT ARE THE AVAILABLE OUTPUTS OF FLOW DATA? On the Model 4040/4043/4045, the flow is continuously displayed on the LCD screen. On the Model 4140/4043, the flow can be displayed continuously or scrolled on the LCD screen. The modes of display are controlled by the use of the TSI Setup utility program. On all models the flow is available as an anolog output (0V to 10V). See questions under Analog output for more details. On all models the flow is available via the RS232 interface. See the RS232 Command Set Manual for more information. This is available to download from our product page. WHAT ARE THE AVAILABLE OUTPUTS OF PRESSURE DATA? On the Model 4040/4043/4045 the pressure is continuously displayed on the LCD screen. On the Model 4140/4143 the pressure can displayed continuously or scrolled on the LCD screen. The modes of display are controlled by RS232 commands. On all models the pressure is available via the RS232 interface. See the RS232 Command Set Manual for more information. This is available to download from our product page. WHAT ARE THE AVAILABLE OUTPUTS OF TEMPERATURE DATA? On the Model 4040/4043/4045 the temperature is continuously displayed on the LCD screen. On the Model 4140/4143 the temperature can displayed continuously or scrolled on the LCD screen. The modes of display are controlled by RS232 commands. On all models the temperature is available via the RS232 interface. See the RS232 Command Set Manual for more information. This is available to download from our product page. WHAT ARE THE AVAILABLE OUTPUTS OF VOLUME DATA? The volume measurement is only available via the RS232 output. See the RS232 Command Set Manual for more information. WHAT ARE THE SPECIAL FEATURES OF THESE FLOWMETERS? Easy to Use; High Accuracy: 2% of reading, not % of full scale; Low Pressure Drop; Fast response flow time: 4 ms to 63% step change; Simultaneous measurement of pressure and temperature; High Stability; LCD Display; Digital and Analog outputs; Temperature & Pressure compensated; User-configurable. WHAT DATA IS AVAILABLE FROM THE ANALOG OUTPUT? The analog output signal represents the flow rate. Temperature, pressure, and volume information are not available from the analog output. WHAT IS THE ACCURACY AND RANGE OF THE TEMPERATURE MEASUREMENT? The measurement range for gas temperature is 0-50°C. The accuracy is ± 1°C at flows greater than 1 L/min. At flows below 1 L/min the heat generated by the flow sensor element heats the gas inside the flow tube. The indicated temperature is therefore higher than the actual flow temperature. WHAT IS THE DIFFERENCE BETWEEN “% OF READING” AND “% OF FULL SCALE” ACCURACY SPECIFICATIONS? The accuracy of many non-TSI of flowmeters is specified as a percent of full-scale. For example, if a 300 L/min flowmeter is specified as 2% of full-scale, the best accuracy is at 300 L/min where the maximum error is 300 * .02 = 6 L/min. At 5 L/min, the allowable error is still 6 L/min which is 120% of the reading. At 2.5 Std L/min, the allowable error is 240% of the reading! TSI flowmeters are specified as a percent of reading. The basic sensor technology used by TSI allows us to make this critical difference. It gives TSI flowmeters an extremely wide dynamic range and excellent accuracy over a wide range of flows. For a TSI flowmeter with a full scale of 300 Std L/min, the accuracy is 2% of reading from 300 Std L/min all the way down to 2.5 Std L/min. Even at 0.5 Std L/min the accuracy is still a very useful 10% of reading. You can download the spec sheet for our General Purpose Flowmeters from our product page. The spec sheet has additional information about the accuracy specification as well as graphical representations of the specifications. WHAT IS THE DIFFERENCE BETWEEN STANDARD FLOWRATE AND VOLUMETRIC FLOWRATE? Please download from our web site: Applications Note FLOW-Standard vs Volumetric. WHAT IS THE FLOW ACCURACY OF THE FLOWMETERS? Models 4040/4043/4045 (high flow) -- Air and O2: ±2% of reading or 0.05 Std L/min, whichever is greater. This means that from full scale (300 or 200 Std L/min) all the way down to 2.5 Std L/min the accuracy is 2% of reading. Even at 0.5 Std L/min the accuracy is still a very useful 10% of reading! N2 and Air/O2 Mixtures: ±3% of reading or 0.1 Std L/min, whichever is greater. This means that from full scale (300 or 200 Std L/min) all the way down to 3.3 Std L/min the accuracy is 3% of reading. Models 4140/4143 (low flow) -- Air and O2: ±2% of reading or 0.005 Std L/min, whichever is greater. This means that from 20 Std L/min all the way down to 0.25 Std L/min the accuracy is 2% of reading. N2: ±3% of reading or 0.01 Std L/min, whichever is greater. This means that from 20 Std L/min all the way down to 0.33 Std L/min the accuracy is 3% of reading. Even at 0.1 Std L/min the accuracy is still a very useful 10% of reading! N2O: ±4% of reading or 0.01 Std L/min, whichever is greater. This means that from 20 Std L/min all the way down to 0.25 Std L/min the accuracy is 3 of reading. See the specifications section of the operator’s manuals for additional specifications regarding temperature and pressure. WHAT IS THE RANGE AND ACCURACY OF THE PRESSURE MEASUREMENT? The pressure range is 50-199 kPa (0.5 - 1.99 Bar, 7.3-28.9 psi) absolute. The pressure transducer will not be harmed by overpressure up to 620 kPa. The accuracy is ±1 kPa. WHAT IS THE RANGE OF THE ANALOG OUTPUT SIGNAL? WHAT IS THE RANGE OF VOLUME MEASUREMENT? 4040/4043/4045: 0.001 to 999.999 Liters. 4140/4143: 0.0001 to 99.999 Liters. WHAT IS THE RESPONSE OF THE PRESSURE MEASUREMENT? Less than 4 msec to 63% of the final value for a 30 kPa step change. WHAT IS THE RESPONSE OF THE TEMPERATURE MEASUREMENT? Less than 75 msec to 63% of final value for a 20°C step change in temperature at full scale flow. WHAT IS THE RESPONSE TIME OF THE FLOW MEASUREMENT? Less than 4 milliseconds to 63% of final value at full scale flow. WHAT SOFTWARE DO I NEED TO CONFIGURE THE FLOWMETER’S OPTIONS? The most convenient way to configure the flowmeter’s options is with a small utility program called “TSI Setup”. This is included on a CD ROM with newer flowmeters or can be downloaded at no cost. You can also enter commands manually using a communications utility program such as Hyperterminal which is supplied as an accessory with most versions of Microsoft Windows. You can download an applications note from our web site that describes how to set up Hyperterminal for use with TSI flowmeters. Download TSI Applications note FLOW-Hyperterminal. WHERE IS THE PRESSURE TAP LOCATED? The pressure measurement is the absolute pressure inside the flow tube near the exit. WHICH GASSES CAN I MEASURE? Models 4040/4043/4045: Air, 100% O2, Air/O2 mixtures, 100% N2 Models 4140/4143: Air, 100% O2, 100% N2 Models 41403/41433: Air, 100% O2, 100% N2, 100% N2O The calibration can be switched for these gasses by using the utility program “TSI Setup”, supplied with the instrument.